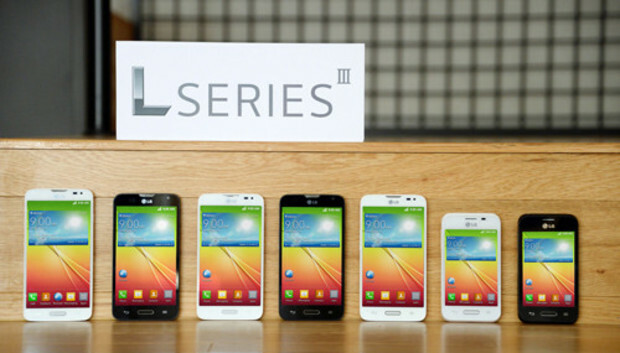 LG Electronics has introduced the third generation of its low-end L series, with three new smartphones that all run Android 4.4 or KitKat. The South Korean company has a history of launching its products ahead of Mobile World Congress, and this year is no different. Last week, the G Pro 2 arrived and on Monday the company added the L40, L70 and L90 to its 2014 line-up of phones. The L90 is the most advanced of the three newcomers. It has a 4.7-inch screen with a 960 by 540 pixel resolution and is powered by a quad-core processor clocked at 1.2 GHz. It also has a 1.3-megapixel front camera and an 8-megapixel rear camera. There is 1GB of RAM and 8GB of integrated storage, as well. The L70 and the L40 are powered by 1.2 GHz dual-core processors and each have 4GB of integrated storage. The L70 also has a 4.7-inch screen with a 800 by 400 pixel resolution, an 8-megapixel or a 5-megapixel camera and 1GB of RAM. The L40 has a 3.5-inch screen with a 480 by 320 pixel resolution, a 3-megapixel camera and 512MB of RAM. As part of the development of Android 4.4, Google kicked off "Project Svelte," an effort to reduce the memory needs of Android so it can "run comfortably" on entry-level smartphones that have as little as 512MB RAM, work that especially the L40 should benefit from. Android 4.4 offers improved performance as well as a more intuitive user interface, according to LG. In addition to running the latest version of Google's OS, all three phones also have removable batteries. LG didn't announce any details on when the L40, L70 and L90 will arrive in stores or their pricing, but the phones will be on display at Mobile World Congress next week.